This mod is still work in progress but works well enough to be usable in my opinion. Feedback is of course welcome. You can freely use this mod in any modpack. No restrictions. Suggestion: Use a torch to be able to ignite the furnace as a consumable as well. This way you can disable the vanilla furnace for challenge packs. This allows someone to be able to smelt their first piece of Iron to get the Flint and Steel. 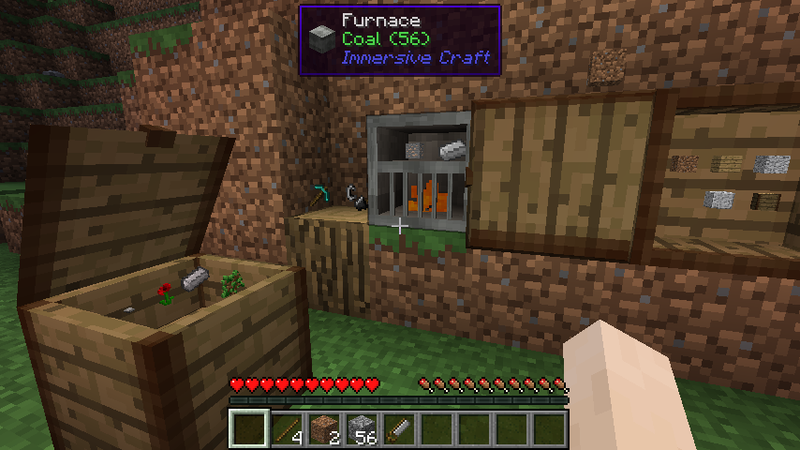 IE: A piece of coal and a consumed torch starts it for one smelting operation. I am really enjoying this mod, but was curious if there is a way to take 9 rocks and turn them into Cobblestone? Or really anything? Or maybe allow for merging of rocks to make small decorative piles/ garden walls. Wow! This is a really cool mod. I've searched for mods that add both stones on the ground and controlled bonfires for a long time. Fantastic work. Could you please downgrade this to 1.7.10? Minecraft has grown into a meta-fest of a game and immersion has become criminally under-rated. I'm going to dig into this mod more once I can scrounge up enough other mods that jibe with what you are laying down here. Great work! does this mod require forge or liteloader? looks really interesting will try. This looks cool i love the shelves that show items. Please some more screenshots!